This too i made it for the festival lunch.Very simple and easy to make.It is just like any other fitters/Bajji. Make a thick batter of besan,rice flour,ajwain,cooking soda,salt and red chilly powder. Soak cauliflower in hot water for 5 minutes and strain the water. Dip each floret in the batter and deep fry in batches. Take them on a absorbent paper and serve hot. 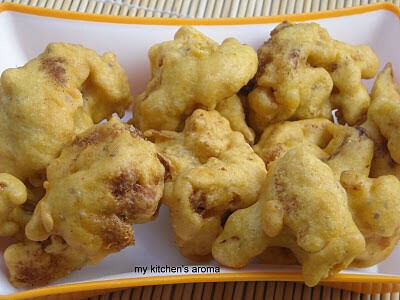 Feel like munching some, delicious crispy fritters..
lovely bhajjis...Who can say no to these nibbles with a hot cuppa???? Yummy fritters, a perfect evening snack. Gobi bhaji looks delicious nice with tea.